The Kinect, as an accessory with potential to cater to core audiences, has been pretty much a wash. Outside of a couple experiences, Child of Eden and Rise of Nightmares respectively, I haven’t found much on the Kinect line-up that would convince your non-party game friends to rush out and buy the device. However, when one comes around, it’s generally worth taking note of and that’s pretty much how I feel about Fable: The Journey. A lot of the videos and impressions I had seen about Fable: The Journey prior to launch didn’t do a whole lot to sell me on it. But having sat down to play the game (yes, sitting with a Kinect game), I’m more than willing to say that my initial impressions were way off base. In fact, the game continues to impress the more I play it, and while the core campaign is finished, I’m still intrigued enough by the game to revisit its arcade mode again and again. Fable: The Journey puts you into the shoes of a young man named Gabriel, an unsuspecting hero type new to the Fable universe and lore. After Gabriel gets separated from his traveling caravan, he’s forced on a detour that will forever change his life. Along the way he meets a wandering seer named Theresa, which ties back into established Fable lore in an interesting way, and quickly uncovers a pair of magical gauntlets which give Gabriel the majority of his offensive capabilities throughout the game. 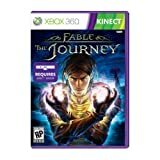 Unlike most Kinect titles, Fable: The Journey is meant to be played sitting down. And unlike the awful mess that was Steel Battalion, Fable: The Journey actually works, at least for the most part. Like most Kinect titles, you might have to fiddle with your set-up a bit, the calibration for aiming your spells tends to go a little off the rails after an extended amount of time, but you can easily save at any point and jump into the calibration menu to adjust. Calibration is mildly time consuming though, usually running your through a two to three minute long process, but you won’t find yourself needing to calibrate all that often. And really, when Fable: The Journey is working correctly; I find it to be a pretty impressive Kinect experience. The game isn’t entirely on rails, and offers up two different exploration styles. One has you riding horseback, traveling down dirt and stone roads from one destination to the next. While on your horse you’ll take direct control over the reins, using both hands to flick the reins to pick up speed, or lifting the reins to your chest to slow down, and over your head to stop completely. Your horse, Seren, has a health meter, so you can’t push her too hard at the risk of running out of health, but for the most part she moves at a decent clip. Certain sequences will have you racing along a path in order to outrun a foe or other danger, which takes the control of speed away from you and instead forces you to steer around obstacles. Steering can be a bit troublesome, as I found the left and right movements to be a little too touchy. It’s hard to do much more than veer hard to the right or left, as opposed to making small turns. This is less troublesome when you’re not in one of the aforementioned events, as Seren tends to auto-pilot a bit while walking, so you don’t need to be as hands on. But when you’re stuck doing nothing but steering, some frustration does set in. The game is never particularly difficult, both with these forced driving segments and just with the combat in general, so rarely are you in danger of actually dying or restarting, but the touchiness of the steering can be a bit aggravating nonetheless. When not aboard Seren, you’ll tackle certain areas on foot. For the most part the game will move you forward of its own accord, but you’ll occasionally be tasked with dodging obstacles and dangers by tilting your body left or right. Unlike the steering on horseback, these movements are simple enough that the Kinect has no trouble interpreting your intent, and work just fine. While on foot you’ll encounter the majority of your combat situations as well, which sort of make up the crux of Fable: The Journey’s more interesting gameplay mechanics. When approached by enemies, you’ll have the option of using both your left and right hand to unleash spells against enemies. Your left hand manipulates one spell in particular, which allows you to push objects and enemies away, or tether up enemies and objects in order to throw them around the environment. Your right hand is used for more offensive spell types, three in total which are bestowed upon Gabriel over the course of the campaign. Using both hands in tandem is key to winning a number of fights, and what is most impressive here is the accuracy bestowed upon the player via the Kinect camera. For the most part, the area where you push forward with your hand is the exact area that you’ll unleash a bolt of magic, and the overall feeling and coolness of making this work means that combat is something you’ll constantly look forward to engaging in. As far as looks and sounds go, Fable: The Journey does a pretty great job of replicating the series that it’s named after. Character art has that appropriately modeled cartoon style to the characters and monsters, enough so that the art looks entirely ripped from Fable 2 and 3, and should be instantly familiar to any fans of the series. Same goes for the voice over work and music, which both stand out as solid, albeit not super memorable once everything is said and done. Still, The Journey manages to wedge itself into the existing Fable universe quite well, without ruffling any plot feathers from the other games. If you own a Kinect, I definitely feel like Fable: The Journey is worth checking out. It works extremely well as a unique, core experience, and considering those experiences are few and far between on Kinect, I think that’s saying something. And if you’re a Fable fan, you’ll definitely find some enjoyment over the setting, characters, and lore offered up here. It’s nice to get a Kinect game that actually works every once in a while, and Fable: The Journey certainly works quite well.